If you were to ask me a few months ago if I thought Avon had cool nail polish, I would of said no. 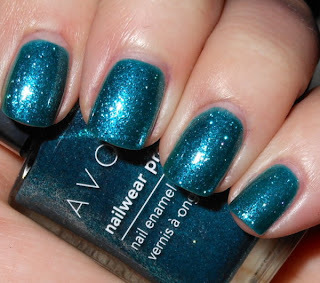 This has changed, Avon has really started to put out some amazing on trend colors. What I also realized I loved about Avon is their prices. They usually are having some type of sale or offer going on, so you can get a lot of bang for your buck. 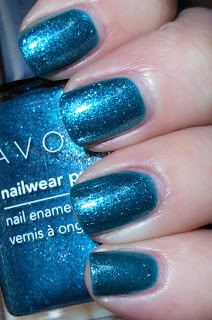 This was one of their holiday polishes from 2011, and it is an eye opener! Sequined Turquoise is a rich teal glass fleck. This is not a dupe do the Zoya Charla and those other colors. This color is darker. This one sparkles like crazy! I had no idea it was that sparkly! I love it. The only sad part about this -hides-, is it was limited edition, and I cannot find it on the Avon site anymore. I debated showing it to you guys, but it was too pretty not to! That being said, I have found it on eBay for reasonable prices, so it's not completely unobtainable! On a side note, if you're interested in Avon products, I recommend going to my friend Alyssa's Avon page. She is an Avon Rep and a nail polish blogger. She is very knowledgeable about Avon products, and can help you find anything you're interested in or answer your questions! I was just thinking about hauling some Avon, lol! I've been seeing more and more I like from Avon. This one is gorgeous! Pretty color, love the sparkle! Wow, this is a stunner! I think I need to haul some Avon polishes soon. I love me some Avon polishes!! This one is really pretty on you. I know, right? I always thought of Avon as such a grandma brand and now out of left field they are killing it with their nail colors. I love every single Avon polish I have. That's a great color...and when I went on to Avon's site...they're having a sale - 3 nail polishes for $7.99...I might be buying a few today! This reminds me a lot of Orly's Sweet Peacock!! I love Avon polishes... for the money, they are really great! I just picked this one up and love it. Avon has some really nice polishes they just put out for Spring/Summer too. Wow I had no idea Avon did much in the way of polish. Do you know if they're available online? I saw this shade on a blog in the past week. Pretty. My objection to Avon is the price in the book is never what you pay. There is always the per item charge for I guess delivery (never sold Avon), tax of course too. Whatever...it always ends up being more than what I thought it would be. Still, from the per bottle price I see it selling for, it is in a good price point if the product has improved. I used it a few years ago and it chipped horrible on me. The thing about Avon is that the colors represented in the book aren't necessarily the colors of what you receive. It's great when bloggers like you swatch these products so other consumers can get a better idea of what the color is like. And I think it's fine to blog about discontinued products 1) They may be still turn up (whether on ebay or if Avon repromotes the color.) 2) Other people bought them and would like to see how it looks or how your experience compares to theirs 3) Sometimes a color is too pretty not to share, and us nail philes like looking at the pretties, even when we can't have them! I bought this color with the holiday gift set they were promoting (with the equally gorgeous eyeshadow set!) and it is truly beautiful! I think it is still available in the clearance (outlet?) booklet, so if you know an Avon rep. you can still order it, and for a discount too! This truly is a stunning polish. I'd never expect Avon to come out with something like this, so it's exciting that they're coming out of their shell more and experimenting with trendier and 'louder' lacquers. :) I'm curious to see what other things they come out with. Thanks for sharing these pictures. You really captured its beauty!